Through The Championship’s headquarters in Tampa, Florida, the league’s clubs are provided with unparalleled support with a growing team of more than 50 professionals across 17 departments, ranging from operations to marketing, communications and sponsorship. The USL Championship was formed when two existing professional leagues were combined into a single league property before the 2011 season. The league was designed to help ensure the long-term stability of professional soccer in North America and featured 12 teams in a pair of six-team divisions during its initial campaign. Among the league’s founding members were five longtime USL clubs with more than 100 years of operation among them – the Charleston Battery, Harrisburg City Islanders (now Penn FC), Pittsburgh Riverhounds SC, Richmond Kickers and Rochester Rhinos. Over the course of the current decade, the sophisticated business model that provides the foundation for the USL Championship has allowed the league to grow into the largest professional soccer league in North America, with more than 35 current members that include world-class ownership groups. The league’s current club owners also hold stakes in teams that compete in the National Basketball Association, Major League Baseball, the National Hockey League, Minor League Baseball and the NBA G-League. In January of 2017, after a thorough application review process, the U.S. Soccer Federation granted the USL Division II status beginning in the 2017 season, recognizing the significant investment and high level of operating excellence within the USL Championship and its member clubs. The pinnacle of the USL Championship’s season brings together 16 teams, the top eight teams from both the Eastern Conference and Western Conference, to compete in the USL Cup Playoffs, as four weeks of postseason action decides the league’s champion. The fixed-seed format concludes with the USL Cup, which is held at the home of the conference champion with the best regular season record. The USL Championship has seen strong, continued growth both as a league in its membership and in attendance across its venues, averaging a 33 percent rise in total attendance from the 2013 season to the 2018 season, with the 2018 season creating new benchmarks for total and average attendance across the league. 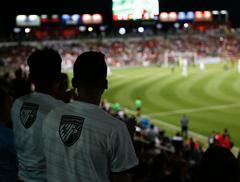 The USL Championship will surpass 2.5 million total attendance in 2018, with its independent clubs averaging more than 6,000 fans per game, almost tripling the average attendance of the league’s first season in 2011. The USL has implemented initiatives to improve the quality of the league both on and off the pitch with the vision, by 2020, of establishing one of the most internationally respected and sustainable professional soccer leagues. Thirty-one of the USL’s American teams set to compete in the 2019 season are located in the Nielsen Top 100 TV Market Universe, with six teams in the Top 15, 12 teams in the Top 25 and 26 teams in the Top 50 markets across the country. All USL matches are broadcast live and in HD exclusively on ESPN+, ESPN3 and on ESPN’s linear networks through a two-year agreement that was reached in March 2018. In addition, the USL Television Network has featured 22 regional affiliate partnerships in 2018. The accessibility of live video showcases the league and its players, coaches, and fans while connecting its clubs and partners to a global audience, presenting them with opportunities to reach additional fans from throughout North America and the world. Rob Hoskins, Chairman; Alec Papadakis, CEO/Managing Partner; Jake Edwards, President; Justin Papadakis, Chief Operating Officer; Lizzie Seedhouse, Senior Vice President, Digital & Content; Steven Short, Senior Vice President, League One. The USL fan skews young (64% between ages of 18-44) and male (79%), comparable with MLS fans and the general population; a high proportion of them are college educated (91%), employed (87%) and with a high annual income (42% have household income of at least $100K). USL fans are passionate about the game of soccer with a high number being current and former players with a strong interest in various soccer leagues. USL fans are highly engaged with the league with more than three-quarters attending at least two games in 2015, while 45% are season ticket holders. The USL fan is tech savvy with more than one-third consuming USL-related news via digital and social platforms on a regular basis. The Lamar Hunt U.S. Open Cup, recognized as U.S. Soccer’s National Club Championship, is an annual competition open to all amateur and professional soccer teams affiliated with U.S. Soccer. The tournament has crowned a champion for 103 consecutive years dating from 1914. In 1999, the competition was renamed to honor American soccer pioneer Lamar Hunt. A record 22 USL Championship teams entered the tournament in 2017: the Charleston Battery, Charlotte Independence, Colorado Springs Switchbacks FC, FC Cincinnati, Fresno FC, Indy Eleven, Las Vegas Lights FC, Louisville City FC, Nashville SC, North Carolina FC, OKC Energy FC, Orange County SC, Penn FC, Phoenix Rising FC, Pittsburgh Riverhounds SC, Reno 1868 FC, Richmond Kickers, Sacramento Republic FC, Saint Louis FC, San Antonio FC, Tampa Bay Rowdies and Tulsa Roughnecks FC. The 105th edition of the historic tournament featured 97 teams in 2018, with USL Championship teams beginning Open Cup play in the Second Round (May 17). This year’s winning team received $300,000, a berth in the 2019 CONCACAF Champions’ League and had its name engraved on the historic Dewar Challenge Trophy, one of the oldest nationally contested trophies in American team sports. The runner-up earned $100,000, and the team that advanced the furthest from each lower division took home a $25,000 prize, which for the USL Championship was Louisville City FC, which reached the tournament’s Quarterfinals for the first time in its history.